As everything becomes more and more expensive, gaming laptops have become relatively more affordable. There was once a time when even the most basic gaming laptops would cost above a lakh and a half, but today, you can get a beast of a machine for that price. However, if you’re on a budget that would be considered tight for a gaming laptop, Amazon, Flipkart and PayTM all have some spectacular deals on some really good machines, all under a lakh. Here are the best gaming laptop deals. MSI’s GF63 series of laptops is the company’s thin gaming machine, without any compromise. Currently available for Rs 59,990 after a Rs 20,000 discount on Amazon, the machine runs on Intel’s 8th generation Core i5 processor. Along with that, it also sports 8GB DDR4 RAM along with a Nvidia GTX 1050 (4GB) for gaming needs. The laptop also has a 1TB hard drive to store all the games you would want. All this comes in a laptop weighing just 1.83 kilos. You can buy the MSI GF63 with the Intel Core i5 processor on Amazon India by clicking here. 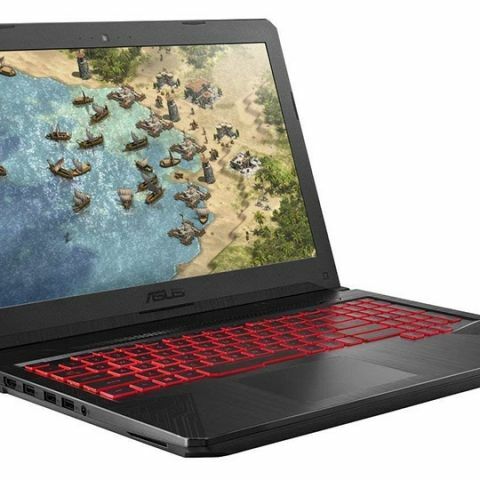 Asus’s TUF range of products was originally limited to desktop a such as motherboards, but earlier this year, the company announced laptops under the same branding. Featuring a more rugged design and adequate specs, the Asus Tuf FX504 that we’re looking at here are sports an Intel Core i5 processor along with 8GB RAM. Graphics duties are performed by the Nvidia GTX 1050 (4GB) and there’s also 1TB storage. You can buy the Asus FX504 from Paytm Mall by clicking here. There’s an additional cashback of Rs 6084, bringing the overall cost of the laptop down to Rs 54801. The Acer Nitro is at the moment the cheapest gaming laptop you can buy sporting an 8th generation Intel Core i7 processor. This particular unit that is currently being offered by Amazon at a discount of Rs 24000 has 8GB RAM, a Nvidia GTX 1050 Ti with 4GB video memory and a 15.6-inch full HD display. Additionally, this particular model also sports 16GB of Intel Optane Memory. You can buy the Acer Nitro on Amazon by clicking here. If you’re looking for a thin and light gaming laptop, but with some extra power, the MSI GF63’s Intel Core i7 variant might be the right choice for you. Besides being powered by the Intel Core i7 processor, there’s also 8GB DDR4 which is upgradable to 32GB, a Nvidia GTX 1050 and a 1TB hard drive. The MSI GF63 can be purchased from Amazon India by clicking here. The final suggest in our list is the Asus TUF FX504 which sports the 8th generation Intel Core i7 processor mated to 8GB RAM, which is upgradable to 32GB. Although the graphics are catered to by the Nvidia GTX 1050 with 4GB video RAM, you get a 128GB NVMe SSD for ultra-fast boot times (for Windows and games) along with a 1TB hard drive for storing all your data. The NVMe and the HDD are both user upgradable. Additionally, the full HD panel has a 120Hz refresh rate, a good starting point for gamers. You can buy the Asus TUF FX504 from Amazon India by clicking here.